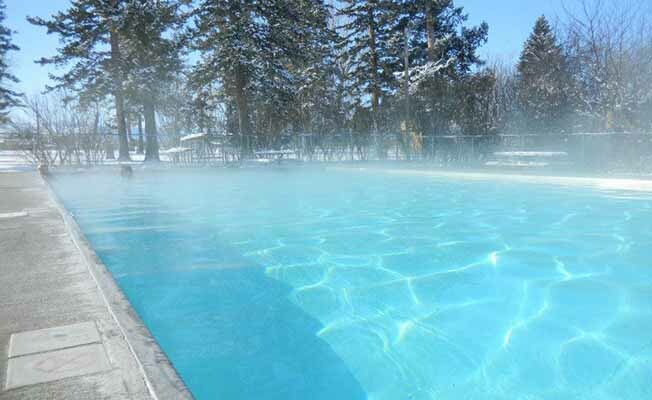 Bozeman Hot Springs is a world famous natural hot springs located in the heart of Montana's beautiful Gallatin Valley. For more than 100 years, visitors have come to relax and rejuvenate in these natural hot springs. A small pool enjoyed only by a few in the late 1800's, has evolved into a destination for area residents and tourists seeking a unique Montana experience with friends and family. It is conveniently located just minutes from Gallatin International Airport, Yellowstone National Park, and Big Sky Resort. Come relax in our natural hot springs. Our facility features 9 different pools with temperatures ranging from 59 to 104 degrees and both dry and wet saunas. Bozeman Hot Springs is the perfect destination for a family get together, a relaxing soak after a hard day skiing, or just for an energizing swim in the therapeutic water. To ensure a consistently clean facility, our water changes out 5 times per day and our inside pools are drained and cleaned every night. A full fitness facility for those who like to get the ultimate workout experience. Use our state of the art Life Fitness equipment and then go relax in our hot springs to rejuvenate your muscles.